Would a midwestern Democrat be perfect to oppose Trump in 2020? If you follow presidential politics, you might be forgiven for thinking that we’re going directly from 2018 to 2020 and skipping next year altogether. How else to account for the endless speculation about the Democratic presidential race and the withdrawal announcements from potential candidates, like New York Gov. Andrew Cuomo and Former Massachusetts Gov. Deval Patrick. The race is already well underway, and we’re going to have to endure it for another 23 months. Much of the attention so far has been on high-profile candidates who are assumed to be front runners, like Senators Bernie Sanders and Elizabeth Warren. But there’s another tier of would-be candidates who may not be as well known nationally but could offer some Democrats some benefits in a general election. Two in particular stand out: Sen. Sherrod Brown of Ohio and Sen. Amy Klobuchar of Minnesota. Both Brown and Klobuchar handily won re-election last month, so they have six years of a guaranteed job to fall back on should they choose not to run or fail in their attempt. More to the point, both won in midwestern states where Democrats struggled in 2016. Trump won Ohio, and Clinton barely won in Minnesota in a state that has generally favored Democrats for decades. Both Brown and Klobuchar reek of that much sought-after political attribute, authenticity. Brown is regularly described as “rumpled,” sporting uncombed hair and preferring sweatshirts to dress shirts. He features his dog in social media and sports a canary pin that a steelworker gave him years ago. Related: Should Bernie Sanders run for president again in 2020? Klobuchar presents voters with another version of the midwest: niceness. (Although she’s apparently a really difficult boss.) Like Brown, her re-election showed just how successful she can be in Republican strongholds. Klochubar won many rural counties that are traditionally deep red. Both Brown and Klobuchar will be coming to the LGBTQ community for votes (and money.) 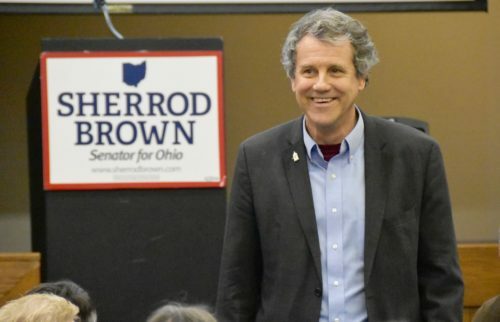 Brown has a long record of supporting LGBTQ rights, putting his political career on the line to vote against the Defense of Marriage Act in 1996. Klobuchar hasn’t quite as extensive a track record, but she’s been a dependable advocate for the community. Both senators style themselves as pragmatists able to rise above partisanship. That may be their biggest drawback as candidates. Neither has embraced Medicare-for-all or other issues that the emerging progressive wing of the party favors. Moreover, Democrats infuriated by the Trump presidency may be in no mood to pitch nonpartisanship in 2020. Of course, that’s what the primary season is for, to see which candidate has ideas that appeal to the most voters. But Democrats desperately want to win back the midwestern states that defected to Trump. If that’s the primary goal, then looking in that neck of the woods makes sense. Brown and Klobuchar certianly hope so.